Most roofs have either a system of rafters and joists or of trusses. 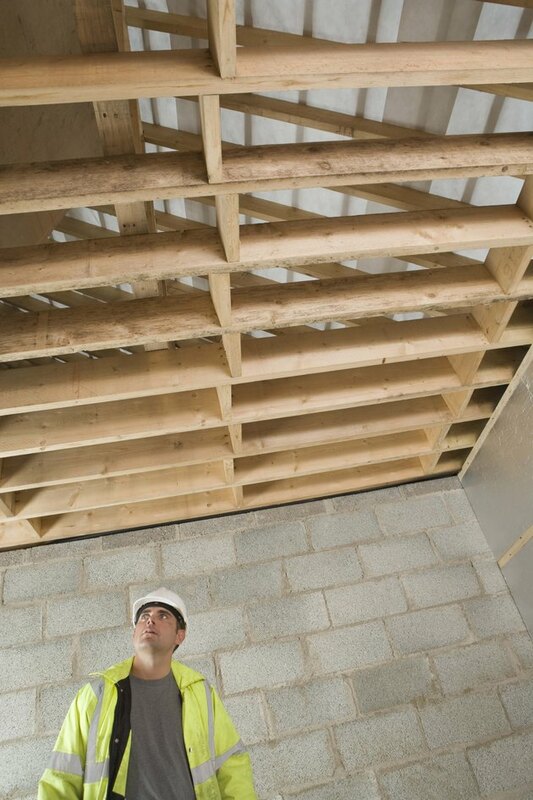 Rafter and joist systems are made up of two pieces of wood that run directly beneath the roofing surface and give it its shape, while joists bridge the gap between the two rafter ends and support the whole thing. Over time, roof rafters can wear, crack or rot, and replacements may be in order. The process of replacing existing rafters so that your roof remains intact, without removing the roof to do it, requires some basic carpentry skills and a few common tools. You can replace old, worn rafters without removing the roof. Measure the dimensions of the old rafters beneath your roofing surface. Use your tape measure to record the distance of both rafter legs. Use a circular saw to cut two sets of new rafters from the same size wood by the same dimensions. Repeat the process for the joist beneath your old roof rafter. Slide one of the newly cut rafter legs into position directly next to the old rafter. Use a hammer and nails to fasten the new rafter to the old, and drive nails through the rafter and into the ridge beam at its top end. Repeat the process on the other side of the old rafter so that the old is sandwiched between two new pieces. Install the second rafter leg in the same manner. Slide the new joists into position beneath each of the new sets of rafters. Use a pencil to mark the slope of the rafter ends onto the new joists. Cut the ends of the joists with a circular saw along the pencil marks so the joist fits snugly against the underside of the rafters at both ends. Drive nails through the joists and into the new rafters at each end. The new rafters will take the load from the old rafters, and the roof will remain intact.